8th February, London – Champagne Louis Roederer is delighted to declare the Louis Roederer International Wine Writers Awards 2016 open for entries. The ‘Roederers’, now in their 12th year, have long been internationally recognised as the ultimate in accolades for wine writers in all countries, through all written – and visual mediums. This year’s awards will be returning to the prestigious Royal Academy of Arts on London’s Piccadilly on 12th September for the Awards ceremony. The Roederer Awards are proud to attract the finest wine communicators – not only in terms of entrants, but also as judges. This year’s panel is no exception with a fantastic team chaired by Charles Metcalfe. As previously, entries can be uploaded directly onto our website, or emailed through to awards@mmdltd.co.uk. 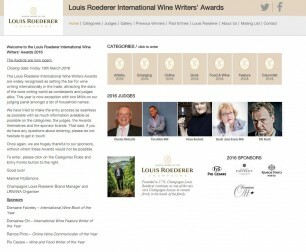 The Louis Roederer International Wine Writers Awards are now open for submissions. Please enter online or email your entry to awards@mmdltd.co.uk.